This is a control panel for the Roland VR09-Combo keyboard, similar to the proprietary iPad-only app. It is still a work in progress most of the functionalities are there. It’s my first panel; constructive criticism is welcome. Supports bidirectional editing of synth and organ tones and control of the built-in effects. Still To Do: changing name of a sound (new name gets uploaded to the synth but it is not shown on the display); load/save sounds to file (has anybody any info on the file formats .UPG and .DAT used by Roland? 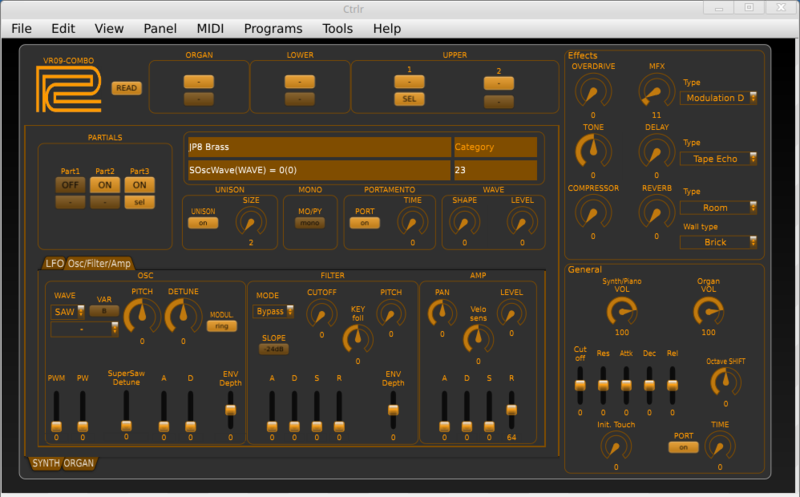 ); some synth tones are not editable (but same goes with the iPad app). It is released under GPLv3. Hi, I updated the panel to recent VR09/730 firmware v1.12 and added some stuff. Interested in working together? Hi Higgy, I am indeed interested in working together. Is your panel already working fine with firmware 1.12? Any chance you could upload it? Thanks! 1.12 is integrated + some more stuff. I’ll give you a download link the next 24h. ergnomics is to improve (too overloaded). I just checked out your latest version: I love it. Thank you for the great and inspiring work. 3b) The second number for the highest velocity force that allowes triggering that sound (with a number higher than the lowest velocity force and maximum 127). 4b) or to the right side of the keybard with a or a ‘+’ in front of a number smaller than or equal to: the 88 minus the number of the highest keyrange. with different zones, easily being able to create complex layered sounds. But first and foremost many, many thanks for the excellent work allready done. I’ve looked everywhere but there seem to be no Korg 03R/W panels out there. I’d faint with delight if this could be edited by someone who knows what they are doing, unlike me, to support the Korg 03R/W as well!